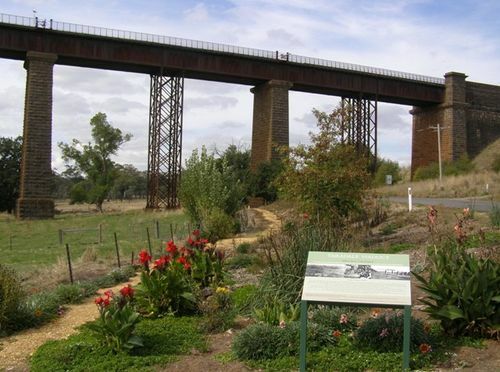 A plaque commemorates the celebration held in 2012 to mark the 150th anniversary of the Melbourne - Murray Valley Railway and the completion of the Taradale Viaduct. Construction of the railway line was begun by the Melbourne, Mount Alexander and Murray River Railway Company , which was incorporated in 1852. Originating from Spencer Street Station in Melbourne, the line reached Sunbury in 1859. By 1861 it had reached Woodend and Kyneton, and had been constructed as far as Castlemaine by 1862. The whole line was formally opened at Bendigo on 20 October 1862 by the Governor of Victoria, Sir Henry Barkly. There are substantial wrought iron and masonry viaducts at Sunbury, Malmsbury and Taradale, as well as two tunnels at Elphinstone and Big Hill. By 1864 the line had been extended, as originally intended, to the Murray River at Echuca. Whilst so many inquiries are being made touching the progress of our future highways, it may not be out of place to devote a few lines to the present state of the railway works. The Taradale Viaduct is a structure of five openings each 120 feet span, and of unusual height. Leaving Taradale, and approaching the viaduct from the highway, the visitor is struck with its stately appearance, which will speak to future generations of Victorian enterprise in the year of grace, 1862. A forest of spars envelopes the stonework, and timber everywhere grapples with stone and iron, huge beams and small beams, spars, stays, shores, logs, baulks, piles, planking, and timber scantling, of every conceivable shape and form, cover the ground, and iron and steel, cunningly shaped and twisted, play their part in making an undivided whole of the huge structure. At present, two piers and one abutment are finished, the remaining stonework will be completed in two months, and the ironwork will be all ready in June-at least, so says Mr. Kerr, the manager of the works. The Argus (Melbourne), 10th January 1862. Plaque donated by Taradale Historical Group Inc.